I can hardly make out my own statements in the mess it creates. IDEA is simply showing what goes into the tomcat log. So you need to modify the tomcat's logging, your web app's logging, or both. One option is to configure your Tomcat Run/Debug configuration to open your web application's log file in a separate tab. Well, in the "Logs" Tab (that can also be seen in your screenshot) I tried toggling the flag for 'Is Active' and/or for 'Skip Content' as well as removing the entry as a whole from the list. I'm not sure how the "Edit Log Files Aliases"-popup can change anything :-? You need to add a log "mapping" to the run/debug configuration. This should point to your web application's log file. The dialog that is shown in my previous screenshot was opened by clicking the Add button. Enter in that dialog a name (i.e. 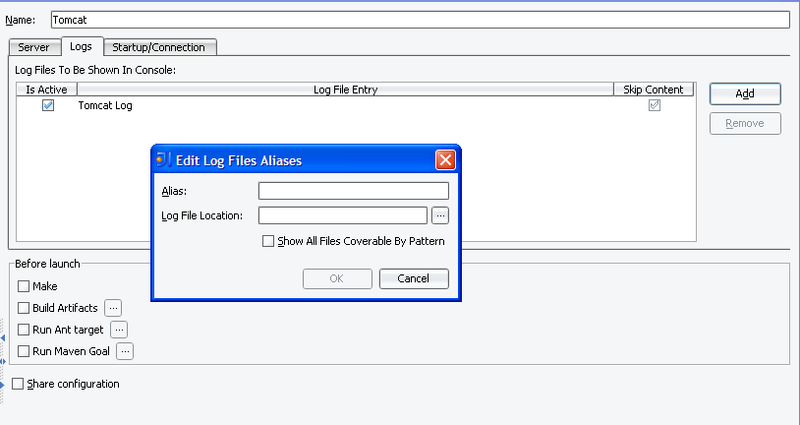 alias) such as "My Web App's Log" and the path to your web application's log file. If your log file name contains a date stamp, you can wild character that. So if your file is foo-webapp-2010-10-28.log, enter "/path/to/logs/foo-webapp-*.log". Save the changes. When you run or debug your tomcat configuration, there will be an additional tab on the Run or Debug tool window, with the name you supplied in the alias, showing the information going into the log file you specified. I am of course assuming your web application logs to a log file specified in some type of logging configuration file such as log4j.xml, logback.xml, log4j.properties, etc. per standard practices. Well, I configured my application to output the logging just to the console - not a file (btw, in production it also puts warnings in a database). Furthermore, you talk of a log file - but how am I supposed to find the 'log file' of Tomcat (because the logging obviously comes from Tomcat directly, not my application) ?